Stephane Lasme (203-C-82, college: Massachusetts) may be suspended for at least three months. The Gabonese centre has reportedly tested positive for the prohibited substance after the TBL quarterfinal game. 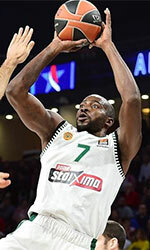 Stephane Lasme is facing a minimum suspension of three months in case the test results are confirmed. Stephane Lasme tallied 11.2 points, 6.6 rebounds per game for Galatasaray in EuroCup last season. His stats read also 11.6 points and 6.2 rebounds per appearance in the Turkish League.